Individuals and HUF who are required to audit under section 44AB in the preceding financial year. However only individuals and HUF who are required to audit because of turnover, gross receipts exceeding prescribed limits are required to deduct TDS. In other words, individuals and HUF who make their accounts audit to show lower profits as prescribed in section 44AD or section 44ADA are not required to deduct tax deducted at source. 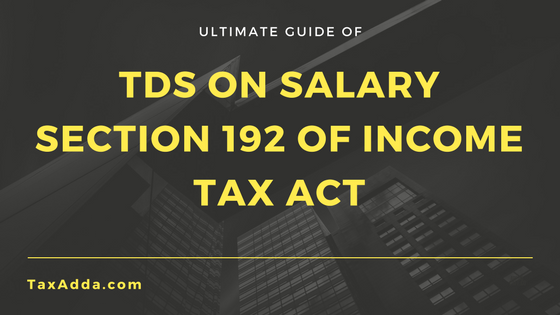 Unlike provisions of other TDS sections, under section 192 tax is required to be deducted at the time of actual payment of salary, not at the time of accrual of salary. If salary is paid in advance or arrears of salary is paid, then tds is to be deducted. No salary is required to be deducted if the estimated salary doesn’t exceed the amount not chargeable to tax. This rule is applicable even if employee doesn’t have PAN. Under section 192 no specific TDS rate is mentioned as with other TDS sections. Tax to be deducted is calculated at the rates applicable to the financial year for which the salary is paid. In other words, first salary of the employee is calculated and then tax is calculated as per the tax slab as applicable to that individual. Although some deductions are allowed while calculating salary as given below. Education cess @2% and Senior & higher education cess @1% is to be added while calculating tds on salary. TDS @ 20% is deductible if no PAN is provided. For eg – Salary payable to an employee is rs. 9,00,000 per year. Deductions allowed to employee under various sections is rs. 1,00,000. Therefore employer should calculate tax on rs. 8 lakhs which comes to rs. 87,550. The employer should deduct tds of rs. 87,550. Every month, 1/12 of this net tax liability as computed above is required to be deducted. TDS is to be deducted even if the salary of employee is likely to exceed the taxable limit. Therefore it is to be assumed that the employee remains employed for whole year and TDS is to be deducted from the 1st month if estimated salary for whole year goes beyond taxable limit. The employer not have to wait for the salary to exceed the taxable limit. The employer may at the time of deducting TDS, increase or decrease the amount to be deducted for the purpose of adjusting any previous deficient or excess deduction.Monthly adjustment of TDS is to be made employee-wise and not collectively for all employees. If the employee has made any payment as advance tax then the same can be taken into consideration for calculation of TDS. Donations under sec. 80G – The donations are made under sec 80G (other than to a notified charitable institute) then the employer should allow that donation while calculating tax deductible. When donation is made to a notified public then the employer should not allow that donation while calculating tax deductible. Circular no. 8/2012 dated oct 5 2012. Other deductions- Deductions under sections 80C, 80CCC, 80CCD, 80CCG, 80D, 80DD, 80DDB, 80E, 80EE, 80GG, 80GGA, 80TTA, 80U. If an employee has more than one employer then he is required to submit form no. 12B, to one of the employers as selected by employee the details of salary due/received by him from other employers. The employer to which such form submitted is required to deduct tax on the aggregate salary from all employers. If the employee is previously employed by other employer, then the present employer should consider the salary received and TDS already deducted. These details should be provided by the employer in writing. If the employee has income(not loss other than loss under house property) under other head of income , then he may send to the employer details regarding such income and tax deducted thereon, if any. The employer will deduct tax considering such income and tax deducted thereon. However, the TDS in such case should not be lower than the TDS which would have been deducted if the employee doesn’t submit such details. If the employee has loss under the head House Property, then it also can be reported to employer and taken into consideration for calculating the tax deductible. Salary or remuneration paid to partners is not taxable in hands of partners as Salary but it is considered as income from business. No employer employee relationship exists between partner and partnership firm. Explanation 2 of section 15 says that “Any salary, bonus, commission or remuneration, by whatever name called, due to, or received by, a partner of a firm from the firm shall not be regarded as “salary”. Therefore no TDS is to be deducted on salary paid to the partners. Some person argues that this provision only applies on salary paid to active partners. Salary paid to inactive partners is not allowed as deduction to the partnership firm under section 40(b) but still its a business income for the partner.The above explanation doesn’t differentiate between active or inactive partner and thus salary paid to any partner is not liable to TDS. The payment of remuneration to whole time director or managing director will be considered as salary under section 192 and thus liable for TDS under this section. While payment of sitting fees, fees for attending meetings etc paid to any director (whether whole time director/managing director or any other director) is considered as payment of professional fees under section 194J. TDS is required to be deducted at the rate of 10% and no threshold limit of rs. 30,000 applies to this. Therefore even if the payment is less then Rs. 30,000 TDS is required to be deducted. TDS is also to be deducted on payment of salary to non-resident employee.